A feature story in April Confectionery Production magazine. The services offered by Ragus span the sugar supply chain, from sourcing raw natural materials to delivering to clients globally. All three have worked across the business, giving them an invaluable insight that enables them to manage potential issues as they arise. “We have all worked on the shop floor, we have all worked on the sales side, and we all still manage our key accounts,” he says. Raw materials are sourced from certified suppliers. The company’s cane sugar comes from African, Caribbean and Pacific countries, while its beet sugar is sourced from within the European Union. “Our manufacturing standards are to BRC and ISO9001,” says Eastick. The applied expertise of a highly specialised team produces a diverse range of products. “With longevity in the sugar industry comes a wealth of knowledge of how different sugars perform, hence we are often called upon to advise both suppliers and customers,” he adds. Ragus specialises in producing three types of natural pure sugar, from crystalline sugars and refinery syrups to custom formulations – the different products vary widely in colour, taste, texture and application. Apart from Candico in Belgium, which according to Eastick produces similar products, Ragus is unique in the industry in that the company does not make white sugar. Instead it has focused on making specialist sugar syrups for the confectionery, bakery, brewery and pharmaceutical industries since 1928. For the confectionery market this includes molasses, treacle, blended sugars, golden syrups and liquid sugars. The company’s pure syrups range from familiar ingredients such as golden syrup to highly specialised products for industrial use, and a team of sugar specialists create and source specialised products to match specific customer requirements. of bespoke blends. “Our product formulations are tried and tested, but we can tailor make our product and unlike other suppliers we can deliver to meet the customer’s needs,” says Eastick. 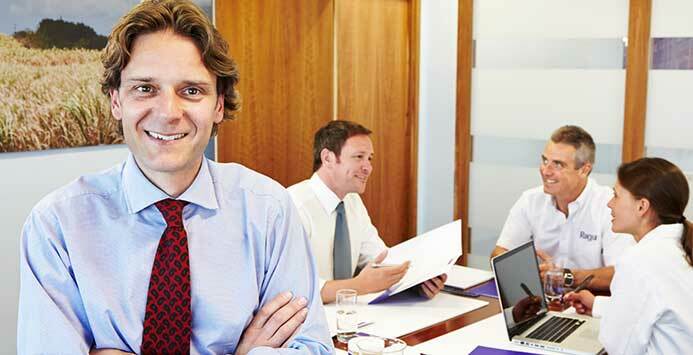 “By staying specialist we have remained profitable and have controlled our market,” he adds. But far from having been adversely affected by any of the big stories in the news relating to sugar prices, or indeed the potentially bad publicity generated by stories relating to the need to reduce our sugar consumption, business at Ragus is good. Most sugar refineries were originally attached to breweries in the 1800s, and the shiny and efficient new production facility at Ragus’ headquarters has been designed to meet its every need and deliver the utmost efficiency. The bespoke syrup plant was designed and fitted by UK brewery supplier Musk Engineering. On 22 June 2005, the European Commission released its plan to reform policies on sugar, the last major crop programme to face changes under an overhaul of the Common Agricultural Policy (CAP) initiated in 1992. “Keeping our heads below the parapet until the reforms had happened allowed us to expand,” says Eastick. Ragus is also able to provide full traceability back to the field. “This has benefitted us, but was more fortuitous than planned,” Eastick admits. Although the company has considered introducing sugar substitutes to its range, the decision has been made not to go down this route and so far, it’s a decision that is paying off. “We believe in the product. It’s a natural product,” Eastick insists. “There is a lot of misinformation in the press about sugar and fructose, but natural pure sugars are healthier than all the other available processed sweeteners and chemical sweetener replacements,” he explains. “And, a teaspoon of sugar contains only 16 calories, which is less than a carrot,” he adds. Sugar is the second most important traded commodity after oil, which means that forward planning for the business means keeping abreast of what’s happening in the global markets. In terms of future sales growth in the confectionery market, Eastick predicts this will be in treacle. “Only Ragus and Tate & Lyle make it,” he says. “This is because it is a volatile product and most don’t want to handle it,” he adds. And with regard to the wider issues relating to reducing sugar consumption in general: “You can eat a lot of sugar, but there’s a lot to teach people and they’re going to get harder to convince,” he says. “We have to be sensible about our intake. The consumer will wise up,” he concludes. 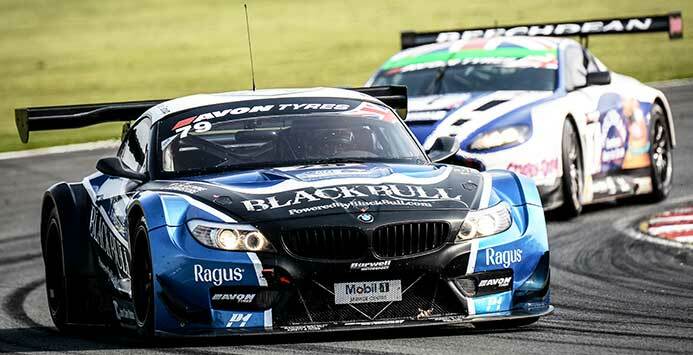 Ragus sponsored Ecurie Ecosse GT3 battles for 2nd at Rockingham. Ecurie Ecosse Powered By Black Bull vaulted to the top of the British GT Championship standings at Rockingham on Bank Holiday Monday (May 5) after Marco Attard and Alexander Sims finished runners-up in the two-hour enduro. But despite another strong result the legendary Scottish squad was left slightly disappointed when unlucky Safety Car periods hindered their chances of a second win in as many rounds after victory in race two at Oulton Park’s season opener a fortnight ago. Their Barwell Motorsport-run BMW Z4 GT3 and its drivers were certainly the stars of Sunday’s qualifying session, with Attard and Sims setting the benchmark laps in both Am and Pro segments respectively to produce a combined time over a second faster than their nearest rivals. Having made a flawless start to Monday’s race, Attard set about building a comfortable gap back to his pursuers only for the first of two Safety Car periods to wipe out his hard earned six-second advantage. Three laps after racing resumed, and with 50 minutes gone, he pitted from the lead and handed over to Sims. As a result of the team’s Oulton victory, the BMW factory driver was required to serve an additional 20-second ‘success penalty’ before re-joining eighth. While the team had made provision for that handicap, its victory chances were effectively ended by a second Safety Car period late in the driver change window, which allowed a number of the Ams that had stayed out to pit while their rivals circulated at a much reduced pace. FF Corse’s Gary Eastwood and Rob Barff gained most, with the Ferrari re-joining from its stop half a lap clear of the pack. And even a subsequent drive-through penalty – for exiting a closed pit-lane – would still result in an unassailable 20-second lead. Not that anyone had told Sims, who within eight laps of the re-start had stormed through the field to second and set fastest lap in the process. First up were Joe Osborne’s Triple 8 BMW and the Beechdean Aston Martin of Jonny Adam, both of which were dealt with in the space of one lap. Triple 8’s second Z4 of Luke Hines received similar treatment next time around before Sims also made short work of the Richard Lyons-driven AF Corse Ferrari. Not even Sims’ heroics would be enough to reel in Barff’s leading Ferrari however, which ultimately took the chequered flag 18 seconds clear. But with extra points available for the two-hour race, second place still represented a fine effort given the circumstances. Ecurie Ecosse’s attention now switches to this season’s second Blancpain Endurance Series round at Silverstone on May 23-25 where Olly Bryant, Andrew Smith and Alasdair McCaig will be back behind the wheel. That should serve as ideal preparation for the team’s next British GT Championship outing, which takes place at the same circuit just one week later. You are currently browsing the Ragus blog archives for May, 2014.